Some people prefer to setup a new email account for their mobile phone and forward important email from their main account to the mobile account. This usually makes them forgot what their email account password was for the mobile email account. 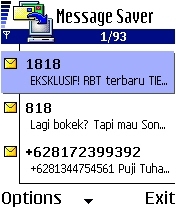 If you forgot your email account for your Symbian phone, you can use my program MailPass to retrieve the password. This software is just like UnlockMe!, it may not be useful for daily use, but can be useful at certain situations. 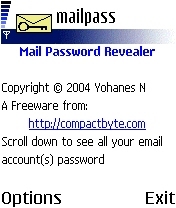 You can download this program from: http://www.compactbyte.com/mailpass/. My Nokia 7610 was brought from a friend of mine, and he forgot the lock code. I could have brought the phone to nokia service center for reset, but usually it takes few days, and it will cost me some money, because it is already past the warranty period. Luckily I found a program to retrieve the phone code for free. UnlockMe! is a software that will allow you to recover the Unlock Code that is currently configured in your Symbian phone. You have to install and run the software on the phone, and it will try to brute force your lock code (it may take almost an hour depending on your lock code). This is the kind of program that you only need once in a while, but very useful when you need it. You can download this program from: http://www.symbian-toys.com/unlockme.aspx. Posted in utility | Comments Off on UnlockMe! If you are an astronomer or you just like to look at the sky then PlanetFinder migh be useful for you. PlanetFinder can show you the locations of the planets, stars, moon, and sun in the sky from any location and for any date and time. 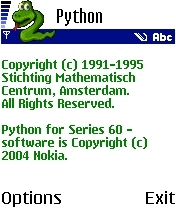 This is a Symbian port of a famous Java Applet with the same name that can be found at: http://www.lightandmatter.com/area2planet.shtml. 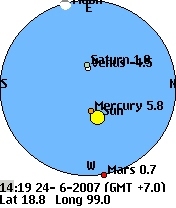 To use PlanetFinder, you will need to know your location (the latitude and longitude). Planet Finder already has a database of major cities of the world, but if your city is not listed, you can find the latitude and longitude information using GPS, or just look your City at Wikipedia. Wikipedia has information about longitude and latitude of most cities in the world. This is the best file manager for Symbian Series 60. This application is more than just a File Manager, it can change your operator logo, activates or deactives infrared and bluetooth, create screen capture, and it can also acts as a process viewer. One of the most useful function is the ability to access your messaging folder, so you can copy files sent trough email, infrared, bluetooth, or MMS to another folder. Adobe is trying to make sure that there is Adobe PDF reader in every popular systems. You can find Adobe PDF Reader for Windows, Mac, Linux, Palm, and also for Symbian. From my opinion, this is not the best PDF reader out there. I only use this application to read small PDF files or for making sure I have downloaded the correct file from the internet. If you intend to read large PDF files, it might be better for you to just convert your PDF files to Mobipocket format, or even HTML format. If you are learning to play guitar, then this application can help you remember the chords. This program is easy to use, and has easy navigation with the arrow keys. This program can be downloaded from: http://www.ubahnstation.net/chords. Locking the keypad is important because it will prevent accidental keypress. Accidental keypresses can make a phone call, delete a contact, and many other things depending on your shortcut settings. 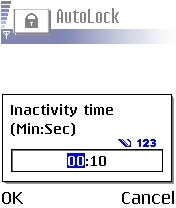 An automatic keylock feature should have been included on all phones, unfortunately, this was not the case with Nokia phones. I always want to know how much memory a program takes. 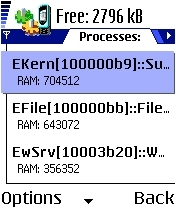 If some program uses a lot of memory, I wont use it, because it will slow down the system. With so many applications installed, sometimes I don’t know that some application has background process (such as Agile Messenger), and collectively this makes the free memory becomes very low. 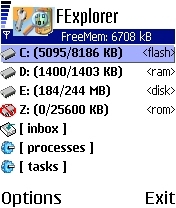 With Tasky, I can see the list of running program (including background programs) and I can see which program takes a lot of memory, and kill the program. This was created by TeleSoftas, and can be downloaded from http://www.telesoftas.com. Programming Symbian phones using C++ is not easy, and many have complained about it. To create a small program is very difficult in C++, that is why some prefer to do Java (MIDP) programming, which is easier. Some people thinks that Java is still to complicated and time consuming to write simple programs, that is why some programming languages was ported to Symbian, and Python is one of them. There are 19 Posts and 2 Comments so far. Freewares for S60 2nd Edition © 2019 All Rights Reserved.